You can now place the Oven! You can turn it on! Or turn it off! Wow! Have so many towns you can't keep track of them all? Or maybe you placed one and didn't name it and now you can't find it? Just use /towns to get a list of all towns you are the Mayor of and their locations. After many months of development, rendering, more development, even more rendering, the new map is finally online! This is the first map update in more than half a year, and as this new map also includes =67, Potato Server, and many Pocket Universes, there's a ton of cool stuff to see! If you would prefer your pocket universe not show up on the map, you can type /togglemapprivacy while standing in your pocket universe. The change will take effect next time the map is generated. 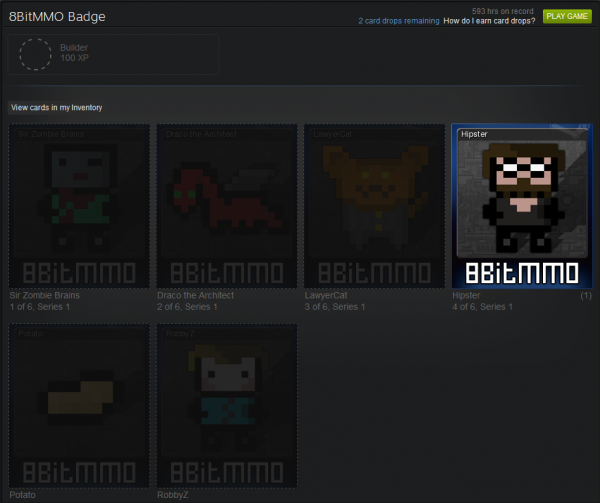 You can now earn Steam Trading Cards in-game! As we are free to play, you should earn approximately one card drop for every $9 USD spent (the same as all free to play games on Steam that have trading cards). NOTE: Currently the Founders Packs do not grant trading cards. I have requested Valve allow this, but not heard back on this request yet.